Merry Christmas everyone! Hope you’ve had a wonderful couple of days with your families and friends. It’s fair to say we ate well in the FoodNerd home, having an epic Beef Wellington for our main Christmas meal instead of the usual turkey, we’ve been making it the last 5 years and it just gets better each year. If you’re very lucky I might share the recipe! I was a tad short of time before Christmas due to one thing or another, so I wasn’t able to make the usual Christmas pudding and cake. Fancying to make something different for pudding. Still sweet but something that wasn’t a huge hunk after such a big, a dish that you could have a small nibble on to get your sweet hit. 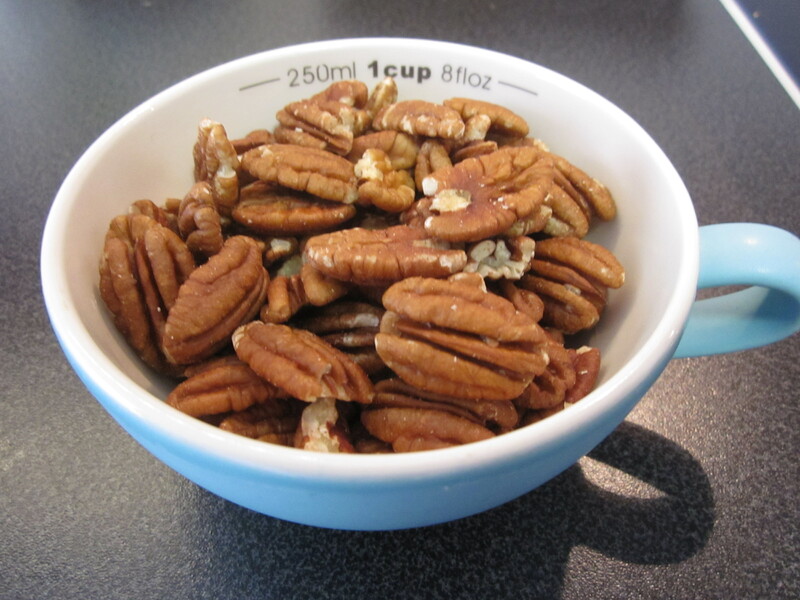 After making my first Pecan Pie this year around Thanksgiving, I’ve been addicted to the buttery goodness that pecans can give a dish. 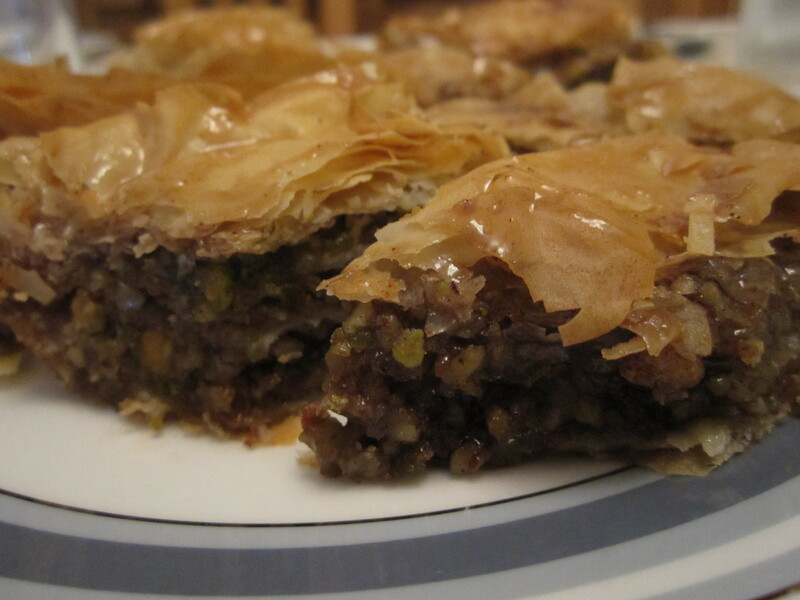 I came up with taking the traditional recipe of Baklava, Middle Eastern dish of filo pastry layers, with a mixture of crushed pistachios and walnuts, drenched in rose water flavoured syrup and applying the classic pecan pie flavours. Enjoy this dessert cut into small diamonds with a strong Turkish coffee to wake everyone up for the next round of board games. A delicious alternative to traditional Christmas cake. 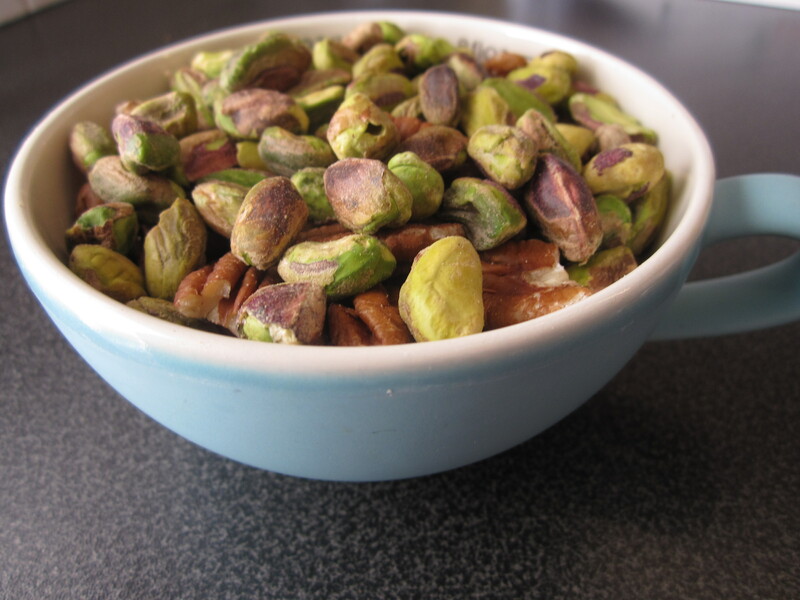 In a small processor, blitz the pecan and pistachios with the spices until a fine crumb. Set aside. 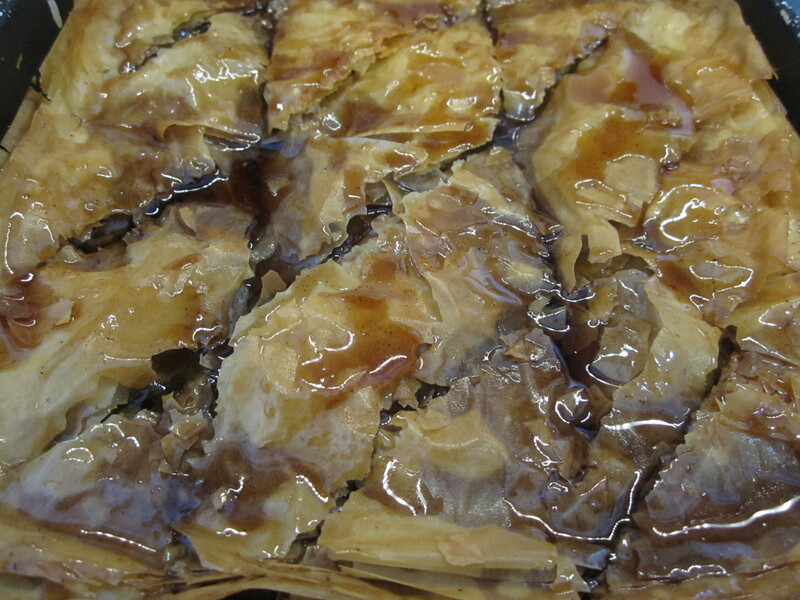 Trim the filo pastry to fit an 8x8" tin and cover with cling film as the pastry will dry out quickly. Brush the base of the tin with the melted butter. Place a sheet of pastry on top, brush with more butter and repeat the process with 9 more sheets of pastry, brushing with butter between each sheet. 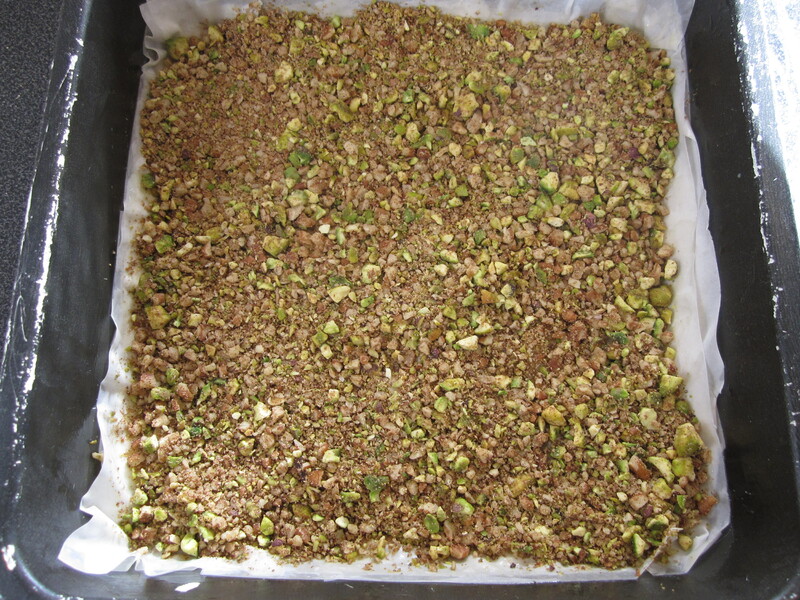 Sprinkle on top a third of the nut mixture. Top with another sheet of pastry, brush with butter and layer with more pastry with melted butter brushed in between for another 10 sheets of pastry. 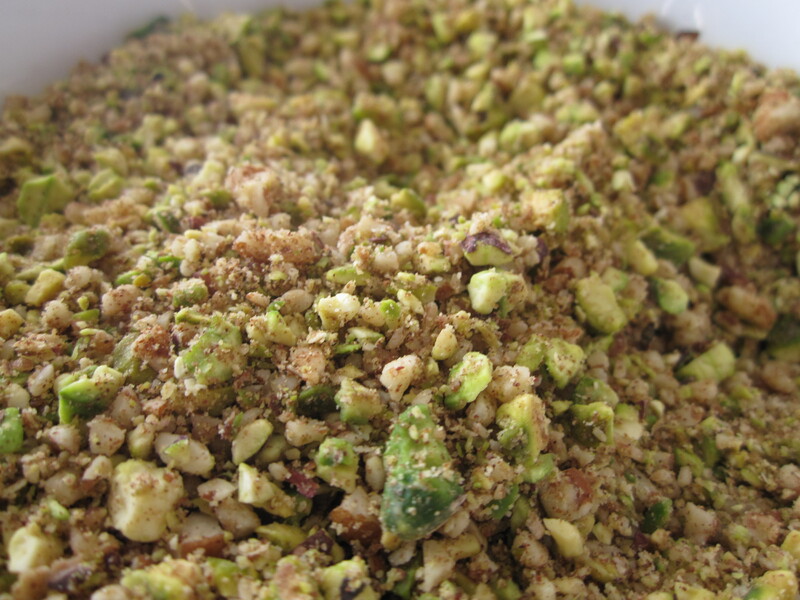 Sprinkle another third of the nut mixture. Repeat the pastry layering process with another 10 sheets of pastry and brush the top with the last remaining melted butter. Bake at 170C for 20 minutes. Remove from the oven and cut into diamond shapes and return to the oven for another 10 minutes. 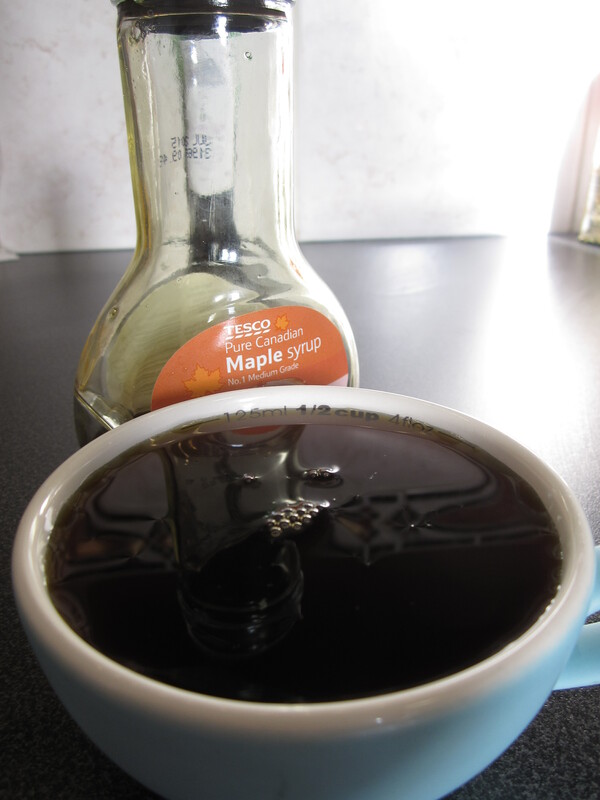 While the baklava is cooking, make the syrup by combing the maple syrup, water, the sugars and cinnamon into a pan, over medium heat dissolve the sugar and bring to the boil for 10 minutes until a thickened syrup. 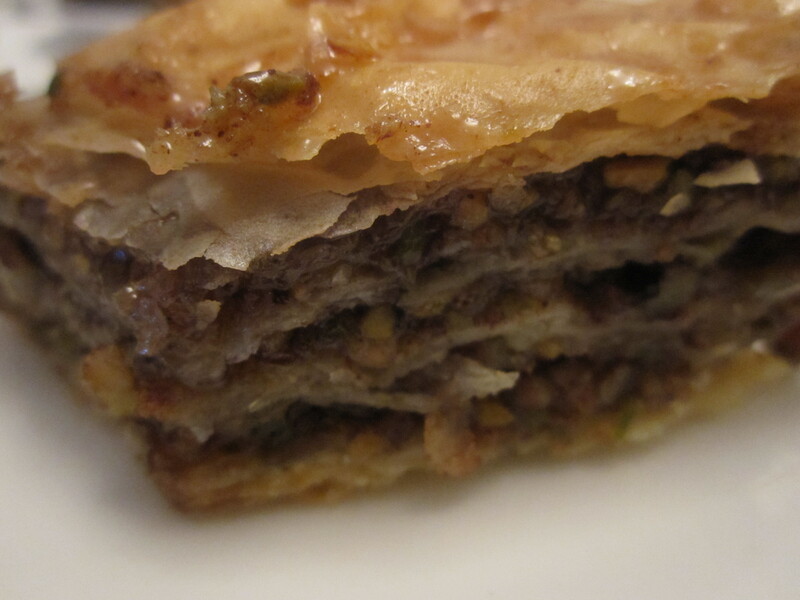 When the baklava is out of the oven and still hot, spoon over the hot syrup - it will look like a lot of syrup but pour it all over as you want the syrup to soak into the nuts and pastry. Leave to cool and enjoy!